Below are the results of our Facebook survey, where we asked Clare parents to tell us what they recommend to do in the county to keep children happy. The information is not verified in detail and may be subject to errors. We cannot take any responsibility for the information given, nor for the links provided. Please be aware that the information is based on personal opinion. Make sure that your child is old enough for the individual activity it takes part. Find a map with the attractions → here. To include self catering accommodation click →here. The numbers on the listing refer to the ones in the map. Low tide fun with just a net, a bucket and spade, a flask and sandwiches in Seafield/Quilty, Whitestrand Doonbeg, Clahane Liscannor; as well as at the Pollock holes in Kilkee, which allow good swimming too. Popular 'Blue Flag' Beach - sign posted from Doonbeg village. 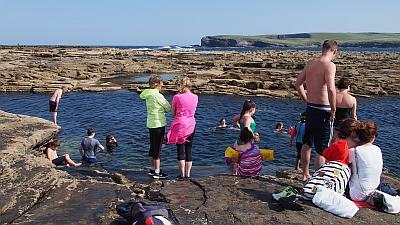 South-West of Miltown Malbay: Sandy beach, safe swimming at the northern end close to the rocks. Recommended by our followers: Lahinch Surf Centre,ages 7-70, free showers sauna and jacuzzi and steam room exclusive to lahinch surf centre; Lahinch Surf experience takes kids of all ages, group lessons, very reasonable and very safe. 12 O’Clock Hills. An amazing walk for all the family. Craggaunowen - The Living Past Experience, a 16th-century castle and an archaeological open-air museum. Considine's bar on Parnell St. Ennis each Saturday afternoon 2.30 to 5.30 trad music with Michael (Blackie) O'Connell piper, Cyril Donoghue on Bouzouki, Siobhan Peoples violin/fiddle. All top musicians! 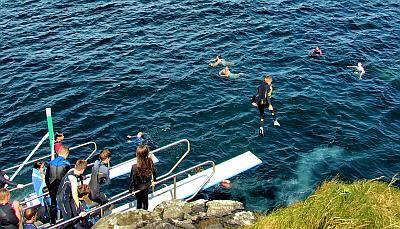 Find the 'Harry Potter Cave' under Hags Head, the southern most cliff of the Cliffs of Moher. West Clare Horse Show- Saturday July 6th 10am till 6pm. Fun for all the family, free fun games, running & novelty races, dog show, music, full bar and catering, plus lots and lots of horses. Tullabrack Kilrush. Clare Museum in Ennis is one of the dandiest small museums in the entire country. Gather sustainably 15 plus amazing seaweeds.